Be generous with your smiles. Commit daily acts of kindness. Skip a meal each week, and send $5.00 to an organization helping the hungry. Erase a border in your mind. Read Chief Seattle’s Letter to the President. Demand honesty from your government. Support nonviolent solutions to global problems. Speak up for a healthy planet. Demand reductions in military expenditures. Pledge allegiance to the Earth and to its varied life forms. Join an organization working for peace. Support an Arms Trade Code of Conduct. Oppose all weapons of mass destruction. Sign the Abolition 2000 International Petition. Work for an international ban on land mines. Use your special talents for a more harmonious world. Study the lives of peace heroes. 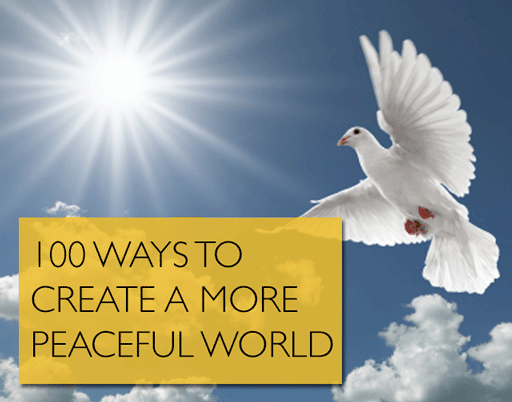 Help create a community peace park or garden. Commemorate the International Day of Peace in your community (the third Tuesday in September). Help strengthen the United Nations. Support the creation of an International Criminal Court hold individual leaders accountable for crimes against peace, crimes against humanity, war crimes, and genocide. Read the Universal Declaration of Human Rights, and demand that your government live by it. Be aware of the rights of future generations. Sign the Cousteau Society Bill of Rights for Future Generations. Make decisions as though all life truly matters. It does! Join an action alert network. Make your voice heard by speaking out for peace. Support health, education and the arts over more weapons. Help educate the next generation to be compassionate and responsible. Accept personal responsibility for creating a better world. Organize a church service on the theme of peace. Support the UN Children’s Fund (UNICEF). Express your views to government officials. Think like an astronaut, recognizing that we have only one Earth. Ring a bell for peace. Plant seeds of peace. Work in a garden. Change a potential enemy into a friend. Watch the movie Amazing Grace and Chuck. Send a note of appreciation. Tell your friends how much they matter. Say “I love you” more. Demand more from your elected officials. Walk by the ocean, a river, or a lake. Recognize that all humans have the right to life. Respect the dignity of each person. Be a leader in the struggle for human decency. Watch the movie King of Hearts. Send sunflowers to world leaders, and call for a world free of nuclear weapons. Oppose technologies that harm the environment. Lose an argument to a loved one. Read Hiroshima by John Hersey. Appreciate the power of the sun. Speak out for global disarmament. Support a stronger world order. Be thankful for the miracle of life. Read All Quiet on the Western Front by Erich Maria Remarque. Remind your leaders that peace matters. Oppose violence in television programming for children. Listen to Beethoven’s Ode to Joy.